President Donald Trump had a successful first year, but there were moments when his supporters felt particularly vindicated about their decision to vote for him. Those moments are “MAGA moments,” when it was clear that Trump was keeping his promise to Make America Great Again. In June, Donald Trump rolled back many of the agreements that former President Barack Obama made with the Castro regime in Cuba, vowing to stand for freedom in the region. 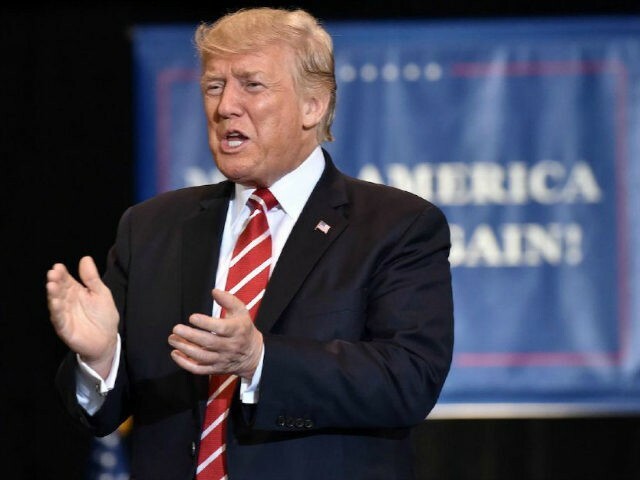 “The previous administration’s easing of restrictions on travel and trade does not help the Cuban people; they only enrich the Cuban regime,” Trump said in a speech at the Manuel Artime Theater in Miami, Florida. Now that I am your president, America will expose the crimes of the Castro regime and stand with the Cuban people in their struggle for freedom because we know it is best for America to have freedom in our hemisphere, whether in Cuba or Venezuela, and to have a future where the people of each country can live out their own dreams. Trump also secured the release of American charity worker Aya Hijazi from Egypt in April, Sandy Phan-Gillis in May, and the release of Otto Warmbier in June. In December, Donald Trump again defied the common thinking of the foreign policy establishment elite, recognizing Jerusalem as the capital of Israel. In February, Trump delivered an address to Congress, urging members of both parties to come together to restore America’s greatness. It was a powerful moment in the House chamber, kicking off Trump’s presidency. As the Polish experience reminds us, the defense of the West ultimately rests not only on means, but also on the will of its people to prevail and be successful and get what you have to have. The fundamental question of our time is whether the West has the will to survive. Do we have the confidence in our values to defend them at any cost? Do we have enough respect for our citizens to protect our borders? Do we have the desire and the courage to preserve our civilization in the face of those who would subvert and destroy it? We can have the largest economies and the most lethal weapons anywhere on earth, but if we do not have strong families and strong values, then we will be weak, and we will not survive. In June, Trump announced his decision to withdraw from the Paris climate agreement, fulfilling another campaign promise. In September, Trump rescinded former President Barack Obama’s overreach of executive power to give amnesty to illegal immigrants brought to the United States as children. Although Trump expressed interest in providing amnesty for the so-called DREAMers, he insisted that it would have to go through Congress. “There can be no path to principled immigration reform if the executive branch is able to rewrite or nullify federal laws at will,” he said in a statement. In January, Trump pulled the United States out of the Trans-Pacific Partnership, fulfilling one of his promises on trade. In April, Trump fulfilled a campaign promise to nominate a strict constitutionalist Supreme Court justice to the Supreme Court to replace Justice Antonin Scalia. Millions of voters said this was the single-most important issue to them when they voted for me for president. I am a man of my word. I will do as I say, something that the American people have been asking for from Washington for a very, very long time. Trump closed out the year by signing his biggest legislation to date. The bill signed by the president dramatically reformed the tax code, eliminated the individual mandate for Obamacare, and opened up the Arctic National Wildlife Refuge in Alaska to drilling. It was the first big win for Trump’s presidency, as he worked together with Speaker Paul Ryan and Senate Majority Leader Mitch McConnell. 1. Trump pushed for additional tax for Hedge fund managers but it was rejected by congress, probably since congressmen get big donations from these people. 2. The $2,000 tax deduction is fair, the problem being $1,400 cash being paid back to those who do not earn enough. This is money that has been going to illegal aliens so needs to be stopped, USA citizens only. 3. Trump has no plan to cut Social Security net payments. Only talk is adjusting future growth, retirement age. With economy poised for rapid expansion, this will generate extra funds for social security. 4. Healthcare reform is next. a. 75% of people get healthcare through their employers. This group needs to be able to determine what insurance features it's employees need. b. 25% get government assistance for their insurance, but Obamacare set a high level of minimum insurance requirements, that forced prices very high. Need to eliminate minimums or set realistic standards. Military insurance (Tri-Care), Medicare, etc each have their specialized needs. c. Pharmaceuticals: while these costs are well negotiated by private insurance, the current law says that the government cannot negotiate prices - very stupid, but a great way that bad congressmen to get donations. 1. Your Guardian reports (12/12/2017) are funded by the Ford Foundation, a leftist/ communist organization primarily funded by George Soros so I do not expect reality from The Guardian. 2. The USA still has 92 million out of work, many who cannot find a job and gave up. Many US homeless cannot even find basic employment since it is taken by low-wage illegals. We do not need illegals, but we do have jobs for MIGRANTS, temporary workers working farm jobs only. Yet, only 7% of the illegals take the farm jobs, the balance take good middle-class jobs in construction, auto repair, office, and medical professionals. 3. One of articles is 'poor' guy here illegally in the the USA for 70 years. What! He couldn't apply for legal entry in 70 years? I have not tolerance for this bull crap. 4. My son was told by a local company that they could not hire him because he did not speak Spanish. Enough said. 5. If you get deported, take you under 18 years old kids with you, even if they were born here. If you do not, then this is child abuse and the parents should never have the ability to enter the USA again. Those 18 years old or more, your on you own and need to follow the law fix your problem. 6. Illegals cost the US and State governments $132 billion per year. Get rid of them because we need the money for other public needs. 7. Non-US citizens have a path to enter the USA, you do not not have any right to enter. We will no long allow illegals to use laws written for citizens, for their illegal benefits. 8. Enough is enough: we the people set the rules and you follow them, if not leave or go to prison. Federal Land Grab Overreach, the Real Issues at Bears Ears and Escalante Staircase. I went specifically to this Utah region to look for Bears Ears and stayed in the Escalante Staircase gas station/motel. There is NO access to any of these areas, we cannot even verify that these photos shown are of the actual areas. The Antiquities Act says it covers only the land for the monument and supporting, but 1.9 million acres (larger than Yellowstone NP) is 9 times larger than necessary. It is still 250,000 acres after the 'reduction'. Already in the region, are several national parks such as Arches, Capitol Reef, Canyonlands, Natural Bridges, Glen Canyon, and Zion. Mesa Verde, Moab, and Monument Valley are only a 1/2 day away too. Trump has a perfect opportunity to start turning American-africans into republican-conservatives by announcing: 1) Review of all police shooting at the federal level for uniformity and fairness of force application 2) Training program for high schoolers as what to do in response to police stops and questioning to minimize being shot. (Do not try and get away, acknowledge their request to pull over, pull over at the soonest opportunity, roll down front and rear drivers side windows so Officer can view if other occupants, drivers hand placed on outside of car window, do not reach for wallet or glove box until Officer arrives at car door. If he requests something, say "may I go to my wallet, jacket, glove box' and do nothing else. 3) Make micro loans for small business startups as in done in some foreign countries. Far from perfect, but a proactive start. 4) Remind that Trump gave $25 billion given to predominantly black colleges vs $4 Billion by obama over 7 yrs in the HBCU program. 5) Deploy school voucher system asap, limit control of local government schools over Charter Schools. Government schooling collects money but only acts as a pre-criminal high school housing project. 6) Streamline HUD housing property by transferring ownership to local housing authorities. 7) Time for Federal troops/military police deployed to Chicago. This was done before. Most crime occurs in same neighbors so police checkpoints on perimeter of the target area works, sends a message to the criminals that police are watching and serious. Self-deportation will be the main way of stopping illegals from coming into this country. This can be achieved by 1) mandatory use of E-Verify on existing and potential hires, if they do not meet the criteria, they are not hired or if existing, they are fired. 2) deny all public benefits to illegals, penalties to state and local authorities if they continue to do this (I'm in California and this Does happen) 3) No anchor babies, no USA citizenship to newborn unless at least one parent is already a USA citizen. 4) If an illegal shows up wanting service at an hospital, they get help but then are held for deportation. 5) Jail time for any USA citizen helping an illegal get services or assistance, including city mayors, police, etc. 6) Only english ballots for voting. 7) no USA entry unless you have a prepaid airline ticket out of the USA, price which is forfeited to the US government if you do not leave as planned. All other entries need to pay a bond which can also be forfeited. If no freebies or no work available, these are the two biggest mechanisms that stop illegals. This is the problem: 1) "Taking Responsibility" is suppose to mean you also get the corresponding punishment, Hillary's definition means don't worry about it. 2) Franken got caught with a photo of him doing the deed, so he had no option but say he's sorry (for being caught). 3) Trump and Roy Moore deny any allegations, not one women came forward with proof or lie detector results. Step 1: destroy North Korea satellites in case they are secretly EMP/Warheads. Step 2: we should already be tracking and following every NoKo submarine, each needs to be destroyed along with destroying submarines at dock, along with war ships. Mine the harbor entrances. Step 3: Pull So Korean troops off of border, then destroy artillery along Korean border, neutron nuke to kill enemy troops directly or due to exposure. Send So. Korean troops northbound cleaning out enemy locations and attempt to reset to new border 100 miles further north while USA troops move forward to support current border. Step 4: time to go downtown, remove capitol and Kim's other residences. No balanced attack can work because of North Korea's military profile. Need simultaneous annihilation of North Korea to stop their response. If CNN wants freedom of the press, then they need to knowledge that Infowars, Breitbart, Drudge Report, Gateway Pundit also have freedom of the press. In addition, Twitter, Google, and Facebook also have to stop censoring them.